(TibetanReview.net, Jan27, 2018) – Despite an objections notice from the Chinese government, the European Parliament’s Subcommittee on Human Rights has on Jan 24 heard a testimony from the President of the Central Tibetan Administration (CTA) at Dharamshala, India, Sikyong Lobsang Sangay on the rights situation in Tibet. The hearing, held in the parliament’s Brussels building, was chaired by Pier Antonio Panzeri. He has called the CTA President’s presence as a “great opportunity” to hear first-hand from a Tibetan leader about the challenges and his vision for the Tibetan community. He also assured continued and unrelenting commitment towards the Tibet issue with regards, “first and foremost (to the) issue of protection of universal human rights, cultural rights, freedom of religion and belief, protecting environmental rights and striving for stability through dialogue,” reported the CTA on its Tibet.net website Jan 25. Laszlo Tokes, Vice-Chair of the subcommittee, was stated to have urged his colleagues to support Tibet’s endeavour to achieve genuine autonomy. He has also said the European Parliament needed to put more effort on minority rights and preservation of Tibetan language in Tibet. 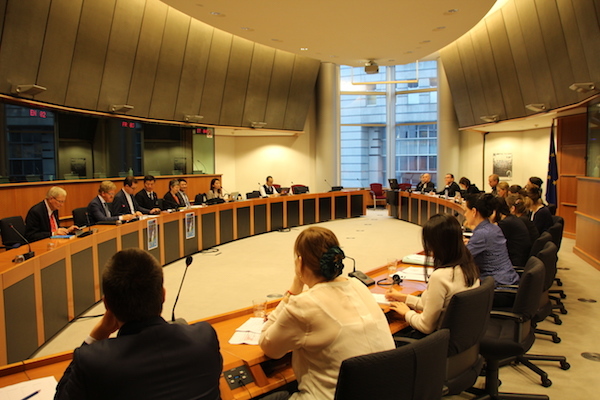 Sikyong Lobsang Sangay was stated to have begun by thanking the European Parliament for its Jan 18 Urgency Resolution, addressing the situation of, among others, the Tibetan language rights activist Tashi Wangchuk and monk Choekyi being persecuted under Chinese rule. He has said the resolution had sent a “message to China” that the human rights issue is an issue of concern and interest to the European Parliament. He has also called it a “message of hope” to the hundreds of Tibetans languishing in prisons in Tibet for expressing their views and for asserting their human rights and environmental rights. He has said the continuing incidents of protest self-immolations by Tibetans in Tibet contradicted China’s claim about having brought a socialist paradise there.